Wooden Camera has debuted its VX Skateboard Camera Microphone ($299), a recreation of the Sony VX1000 microphone for use on modern cameras to record action sports sounds. Wooden Camera said four microphone capsules are arranged in the same orientation as the original VX1000 and a digital signal processor emulates the frequency filtering and compression. The mic’s features include a 48-hour battery life, charging via USB-C, hot shoe or 1/4-20 mounting and options using a 3.5mm TRS cable. 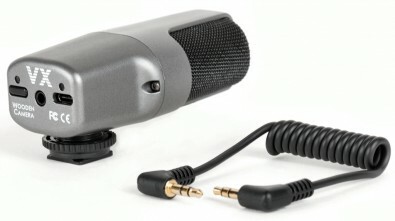 A horseshoe mounting bracket, XLR Adapter Y Cable and custom windscreen by Rycote are also available. The Sony VX1000 was introduced in 1995 and changed the way skateboarding videos looked and sounded. The internal microphone design was particularly good at recording clear skateboard noises compared to previous Hi-8 cameras. Since the move to HD, there has been no standard for audio capture in skateboarding which is why no two skate videos sound the same.